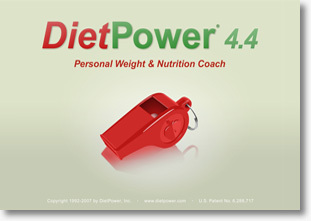 DietPower's latest version, 4.4, was last updated in 2016 and originally released Feb. 26, 2007. You can upgrade in as little as two minutes, even if you no longer have your old version. Click to upgrade to Version 4.4. What's new in DietPower 4.4 depends on which older version you have now. If you're not sure, look at the release dates and logo screens below or click Help > About in your current version. Real-time Eating Coach™ tells which foods are best to eat now. New "scoreboard" integrates your Food Log, Calorie Tally, Nutrition Quotient, Key Ratio, WaterMinder™, and Eating Coach into a single screen. Free updates continue to improve your DietPower indefinitely. Smart Seconds™ tells which food that you've already logged will most improve your Nutrition Quotient (NQ). More nimble food searching lets you sort by calorie content, description, and impact on your personal nutrition. Nutrient History now monitors your intake of Trans Fat. Improved Portion Editor logs any food by volume or weight. Smarter Advice Line is better tuned to your nutritional status. Free daily nutrition and fitness news appears right in your Food Log. New Exercise Dictionary offers updated entries and color-coding of intensity levels. Calorie budget is even more sensitive to your metabolic rate and target date. Expanded toolbar offers single-click access to every major function. More helpful Help includes comprehensive index and search. Animated tutorials make learning easier than ever. "What's This?" lets you query any feature with a click. Daily tips teach you fine points of the Food Log. Simpler installation makes upgrading a snap. Updated Food for Thought "knows" your personal interests better than ever. Backup reminder prevents you from losing records in case of hard-drive crash. More flexible storage obeys Windows 10, 8, 7, Vista, and XP directory rules. Ask your Personal Nutrition Agent what you like to eat that will make you healthier. Monitor your carbs, fat, cholesterol, or 30 other nutrients on the fly. Chart up to 6 custom variables of your own choosing: blood pressure, waist size, cholesterol readings—whatever you like. Automatically adjust your water budget to exercise temperature. Become a smarter eater by watching your Nutrition Quotient™, a single number reflecting your dietary balance. Try some of the 101 delicacies we've added to our Recipe Box. Choose a constant calorie budget or one that adapts to your metabolism. Record meals in either metric or English measure. Earn extra calories from 1000 kinds of exercise. Plan balanced menus by logging on future dates. E-mail your recipes to friends. Automatically adjust your calorie budget to sodium intake. Record your running, cycling, or swimming times to the nearest second. New Dietary Allowances. Released in September 2002 by the U.S. Food and Nutrition Board, these include updated guidelines for fat, carbohydrate, sugar, protein, cholesterol, and fiber. Even speedier logging of meals, thanks to a new color-coded Smart Search that learns your favorite foods and understands even more clearly what you are looking for. More additions to the Help system, including 29 new topics, deeper information in existing topics, and the latest research on vitamins and the risk of heart disease and cancer. An animated tutorial showing how to use the Food Log. A larger Food Dictionary. We've incorporated 5000 fast-food and other chain-restaurant entries into the dictionary, bringing the total number of entries to 21,000. The WaterMinder™, which alerts you when your water consumption falls behind your goal for the day. The Body Log, which lets you record and graph not only your weight but any of 36 other variables—including as many as three custom variables that you set up yourself. The Menstrual Log (an option in the Body Log for women under 60), which adjusts your calorie budget for water retention during certain days of your cycle. The News/Update button, which takes you to a page on our Web site containing the latest nutrition and fitness news, as well as other features. Tips for logging your meals a lot faster, from DietPower users who average only four to eight minutes a day. A better selection of "Food for Thought" items, including more tips on getting the most out of DietPower. An improved Ideal Weight Calculator, which explains more precisely what "ideal weight" means and what to do if your ideal seems unattainable. An improved Travel Disk function, which lets you specify not only a drive but also a folder or subfolder for backing up your diet records. An expanded, updated Help system, covering more topics in greater detail and incorporating more recent findings in nutrition research, as well as new dietary allowances for some nutrients. The Diet History button, which opens your Diet history, a table showing your weight, metabolic rate, and other variables for each day since you enrolled in DietPower. A "What's This?" function that instantly explains almost every feature on your screen—in the most lucid English you'll find anywhere. explain the significance of the new RDAs in the Help topic for each nutrient. provide a 5-Minute Picture Tour that serves as a handy reference for getting the most out of DietPower. The Tour also helps newcomers learn the program faster. prevent the recipes you've created from being lost if you reinstall DietPower without first saving a copy of your Recipe.fd file. in the Recipe Box and Food Dictionary, list the number of calories per serving in a recipe you've created, instead of calories for the whole recipe. in the Exercise Log, make the Duration Editor with Speed and Distance easier to understand. warn you not to enroll a new user with the same first name and birth date as a current user unless you want to overwrite that user's records. provide clickable links to DietPower's website in the program's Help system. track your metabolism more accurately than Version 2.1 did—particularly when you leave your Food Log blank for more than a day at a time. calculate your ideal weight more precisely. let you jump to a different working date by simply clicking the date on your Weight History screen—you no longer have to use the Calendar button. ...(DietPower's original ancestor, a DOS program sold from 1992 to 1996), you are a DietPower Pioneer! Contact us. See our upgrade page or contact us.